Jonathan Sullivan has invited all Catholic bloggers to write on the theme of “Penance” for Ash Wednesday, February 22, 2012! As I reflected on what I wanted to do with this theme, I thought about how we change from simply doing “penance” by giving up candy, pop, chocolate and more to really understanding what “penance” we are called to do in the complicated world we live in during this season of reflecting on the life, suffering, and death of Jesus! I’m inviting high school teachers and catechists to engage their students in a reflection and response to the question – What “Penance” for Lent? Direct your students to read the American Catholic article LENT: FASTING FOR THE FEAST by Jim Wilwerding. As they identify the phrases, use a highlighter or underline them to mark the phrases that answer the question – Why Penance? Then ask the students to look back over the highlighted or underlined material. Read through the phrases to achieve a deeper understanding and answer the questions – What “Penance” for Lent? Why “Penance” for Lent? Introduce an online moviemaking tool – Dvolver – to your students by showing them how they can create an animation movie with their script. Check out the example – What Penance? Remind the students with this tool that their text is limited to 100 text characters for character’s lines. Also, you can only develop three scenes. 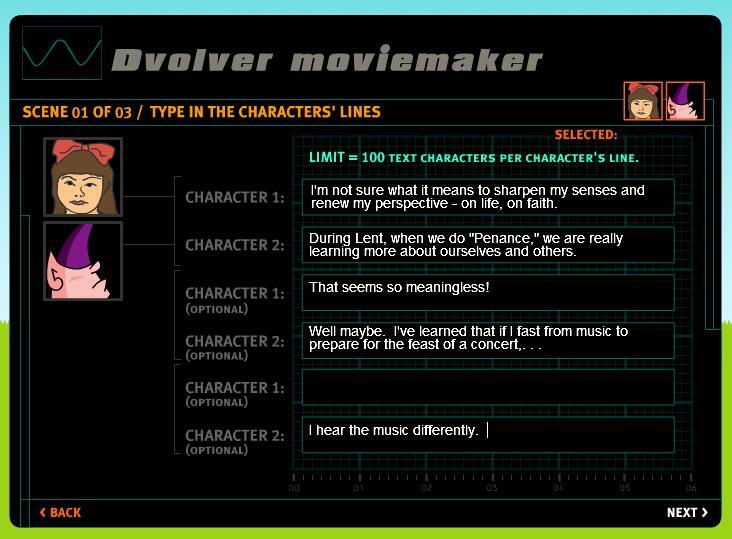 If you are using the Dvolver Moviemaking Tool, carefully consider your dialogue as you are limited to100 text characters per line. Mary: I’m not sure what it means to sharpen my senses and renew my perspective – on life, on faith. 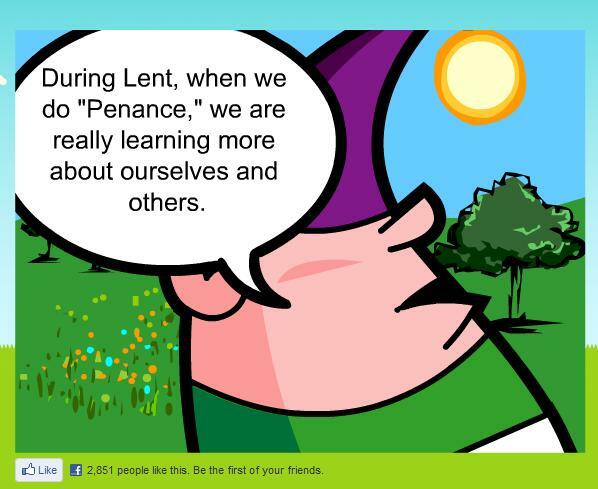 George: During Lent, when we do “Penance,” we are really learning more about ourselves and others. Mary: That seems so meaningless! George: Well maybe. I’ve learned that if I fast from music to prepare for the feast of a concert,. . .
George: I hear the music differently. Mary: I never thought about doing that! George: When I’m at the concert, I do hear the music differently than if I had listened all week to the group. Mary: I’ll try that the next time I go to a concert. George: Great! You will be learning what “penance” is about. That is giving up something in order to improve what you see and hear! George: Right! So during lent, when we do Penance, we’re really preparing for the feast of Easter! Mary: My life is so busy right now. Maybe I need to simplify what I’m involved in. George: If you simplify, you will have time to pay attention to …. Once they’ve completed the dialogue, then go to – Dvolver MovieMaker . This is a Web 2.0 tool that will allow you to create an animated movie that you can easily share with others. However, it will only allow you to create Three (3) Scenes. See the example. When the students have created their animation story, they will have the opportunity to send the link of their animation to you and others. (Note: If you have a class blog, you can incorporate this activity into the blog. As students create their stories, then they can include their animation movies as a Response to your post. Or, you may want to post them all on one page and invite your students, parents, and friends to vote for the most meaningful animation story.